The “Rosemary Shortbread Sandwich Cookies with Concord Grape Jam,” from the September/October 2018 issue of Bake From Scratch, are something to be proud of. Cookie happiness is here. In the bowl of a stand mixer fitted with the paddle attachment, beat butter, 2/3 cup sugar, and chopped rosemary at medium speed until creamy, 3 to 4 minutes, stopping to scrape sides of bowl. With mixer on medium-low speed, add vanilla and salt, beating until combined. With mixer on low speed, add flour, beating until combined and dough starts to come together. Turn out dough, and shape into a disk. Wrap tightly in plastic wrap, and refrigerate until firm about 45 minutes. Preheat oven to 350 degrees F. Line two baking sheets with parchment paper. On a lightly floured surface, roll dough to 1/4-inch thickness. Using a 2-inch fluted round cutter dipped in flour, cut dough, re-rolling scraps as necessary. Place on prepared pans, and sprinkle with remaining 2 Tbsp. sugar. Top half of cookies with rosemary leaves, if desired. Refrigerate for 20 minutes. Bake until lightly golden and tops and edges are set, 14 to 16 minutes, rotating pans halfway through baking. Let cool on pans for 5 minutes. Remove from pans, and let cool completely on wire racks. Place a spoonful of concord grape jam on flat side of plan cookies. 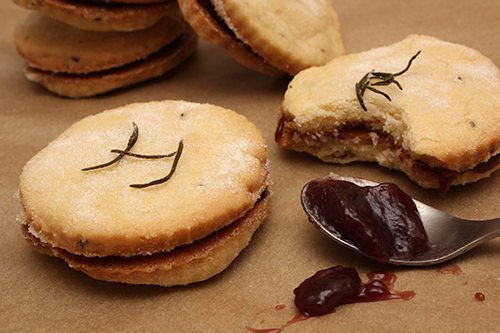 Place rosemary-topped cookies, flat side down, on top of jam. Inspired by the brief concord-grape season, I bought myself a jar of good jam. After beating the cookie dough in your mixer, you get to shape it with your hands into a disk, and enjoy the rosemary scent. You’ll know, then, that you’re doing the right thing for all the right reasons. I baked these cookies for 14:30 minutes, until golden. Taste buttery rosemary and crispy sugar. The grape jelly in between makes an even sweeter and bigger cookie. A significant cookie, as I’ve said. Next time, I will indulge in a treat that turns about to be a BIG THING: “Nutella Flower Bread” (Google it!). Share it with me when you return to my site next week.